NO MORE READY-MEALS FOR SHARKS! The university of Stellenbosch has created a department to market some of the incredible scientific advances that their scientists dream up. For example: an eco-friendly shark barrier. Existing shark nets are a mixed blessing, because other marine life gets trapped in the netting and perhaps, on balance, the nets do as much harm as good. But the bright boffins have come up with the brilliant idea of an artificial kelp forest, which emits a small magnetic and electric current. I learn that sharks have very acute sensors located on their faces, and would sense the hostile barrier, and swim no further. Isn’t that clever? When last did you take your Inner Child on a Playdate? Nina and I took our Inner Children on an outing last week to the Two Oceans Aquarium, down at the Waterfront. Because Cape Town is situated on a Peninsula, it is literally bounded by two oceans: the Indian Ocean on the Eastern coast, and the Atlantic Ocean on the Western coast. Hence the name of our Aquarium. I live on the ‘cold side’ i.e. the Atlantic, and believe me, those waves are cold! I never swim on ‘my’ side – just paddling at the water’s edge is tinglingly painful if not downright unpleasant. 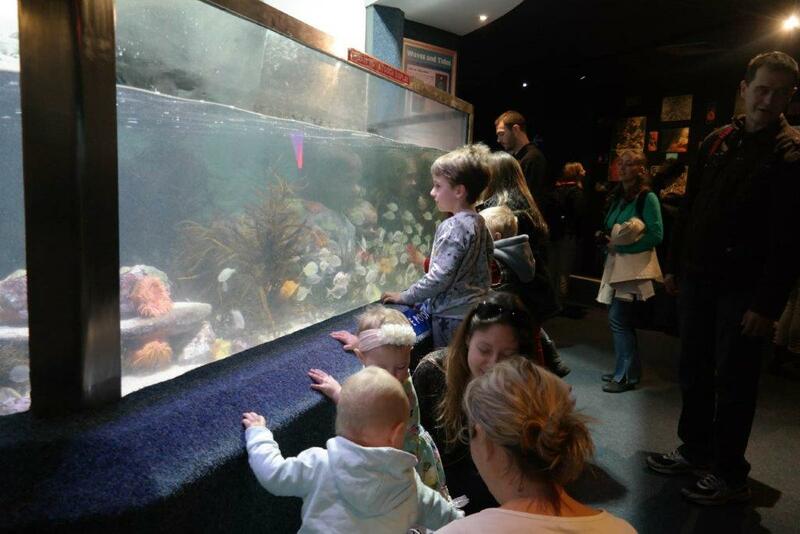 Neither of us had visited the Aquarium for years, so we joined the heaving hordes of families, school kids and tinies (it’s school holidays, so our visit was somewhat ill-timed, but never mind). On the upside, we got a very generous Pensioners’ discount at the ticket Office, so that offset the downside. First stop was the penguin pool at feeding time. Nina couldn’t get over how the penguins patiently lined up waiting for the young lady to arrive with a pail full of fish. She sat down on a rock, and carefully fed the birds, one by one, posting the fish down the birds’ open beaks . Her colleague sat by her side, armed with a clipboard, and ticked off the dinner queue one by one. 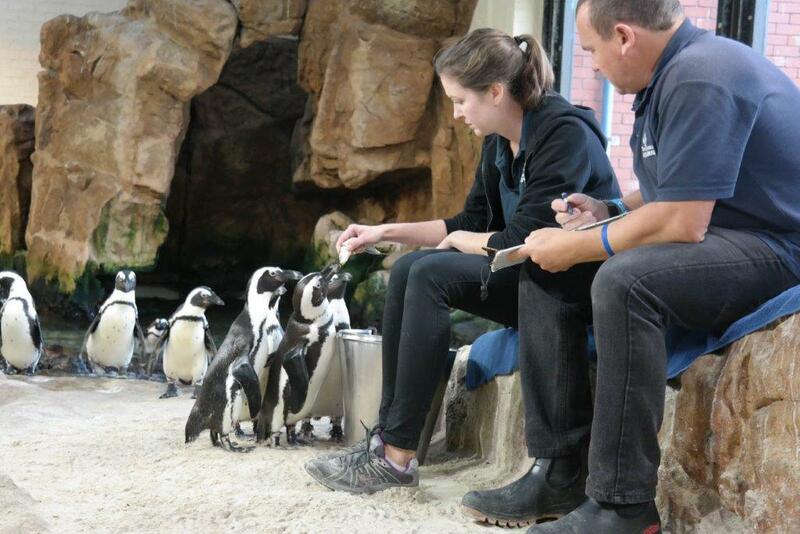 The penguins’ daily fish intake has to be carefully monitored. Apparently each penguin has a unique pattern of black dots on their white chest feathers, which serve as identifiers. A sort of penguin fingerprint, if you like. 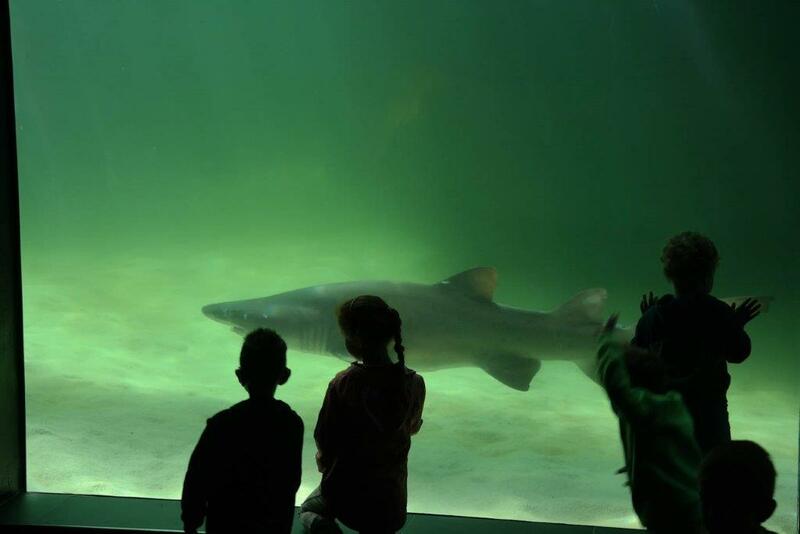 Next stop was the massive shark tank, where large sharks glided ominously by . The little kids were fascinated, noses pressed to glass. I’m not crazy about sharks. Periodically we lose a surfer or swimmer to a Great White in our coastal waters. I wish they’d stick to a diet of seals. Way back in the mid 70s I saw Jaws at the movies, and nearly had a cardiac arrest. The traumatic experience has remained firmly rooted in my memory. Moving swiftly on, we found the beautiful, gaudy, small tropical fish. I love these, the bright colours and the exotic shapes. 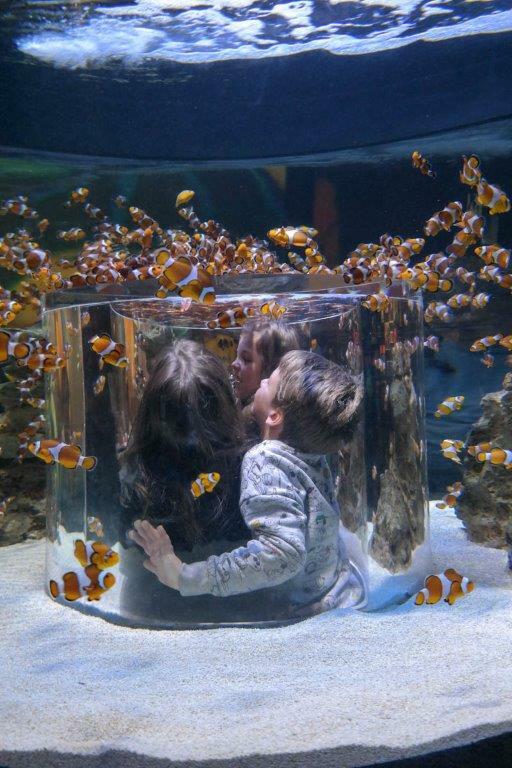 There’s a wonderful tubular display with a Perspex bubble mid-column into which small kids can crawl, stand up and be surrounded by clouds of flitting fishes. Both Nina and I are short ladies, and we eyed the crawl space longingly, but feared we might get stuck in the narrow entrance tunnel, so sanity prevailed and we dragged ourselves away to the dark, mirrored gallery, displaying the jelly fish. 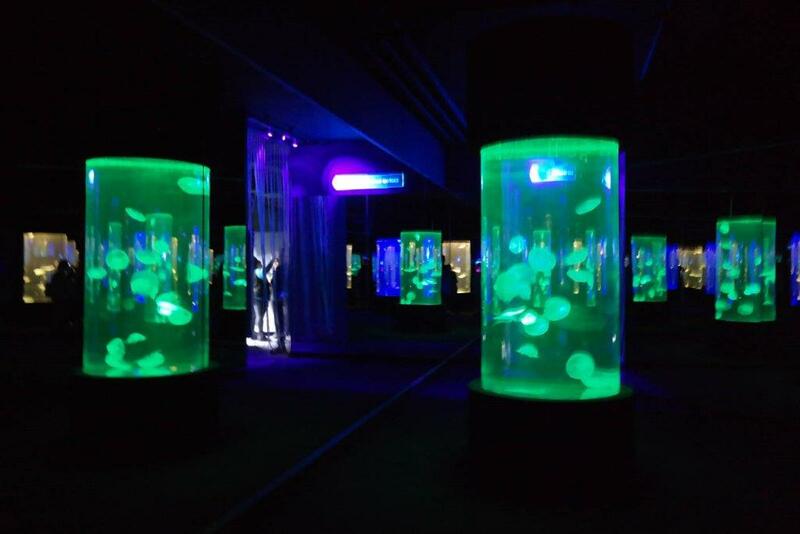 They were also displayed in vertical tubes, and as you can see from the pics below, the effects were spectacular. I’ve saved the best until last – the small sting rays. 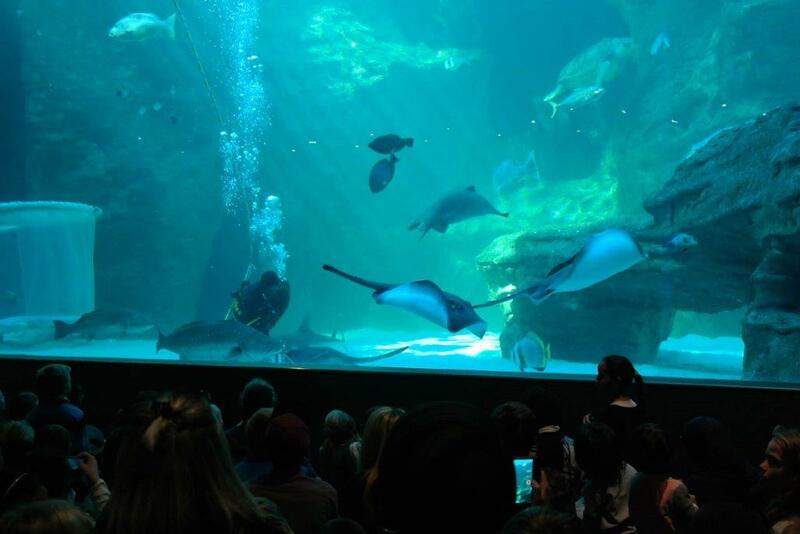 My favourite was the huge tank where the diver was feeding the big fish and the rays. I can watch rays all day long. They glide so effortlessly through the water, gently undulating the edges of their bodies, which creates the illusion of flying. Thanks to Nina Ganci for all the pics.